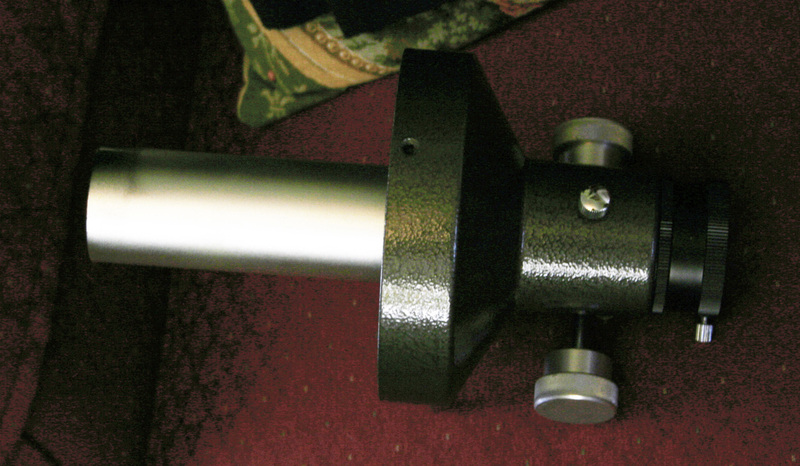 Overall, I am very pleased with the quality of my Kepler refractor, except for the rack & pinion focuser. After considering the options available I decided to upgrade the focuser to a custom made crayford from Wyorock Telescope Works. I sent them the entire R&P focuser assembly, and they sliced off the old focuser and custom fitted a rotatable crayford with a 6-inch draw tube. The Wyorock is great - it can be collimated and the action is very smooth. The only downside of my Wyoropck is that it is a single-speed focuser, so I modified it by adding a GSO dual-speed microfocuser kit. The GSO kit came from Agena Astro. I modified the microfocuser's black plastic body to fit the Wyorock and ordered a new stainless steel focuser shaft from Wyorock. 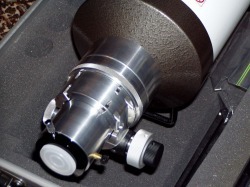 The original Wyorock shaft was too short to fit into the GSO microfocuser and the shaft that came with the GSO unit was not the correct length or diameter. I attached the GSO body to the Wyorock using automotive grade double-sided tape to avoid drilling any holes in my new focuser. The tape actually works fine. The rack and pinion focuser was cut off the tube adapter. The cut end of the adapter was threaded to receive the new parts. 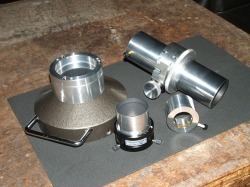 The finished parts of the new Wyorock focuser assembly. 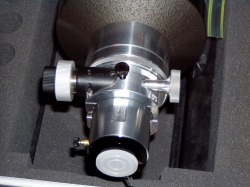 Bottom view of the Focuser.